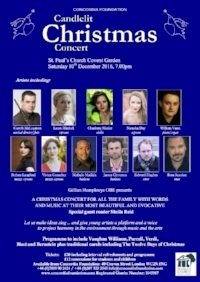 Christmas simply wouldn’t be Christmas without the wonderful evening in St Paul’s Covent Garden that brings a wealth of music, readings, joy and the gladdest of tidings to all who attend. For information on our 2017 Candlelit Christmas Concert please click here. Our Candlelit Christmas Concert 2016 was a very special occasion, marking the completion of our 21st year, attended by so many of our wonderful Friends and Supporters. We concluded the thrilling programme with a special arrangement of Serenade to Music by Vaughan Williams (arr. Paul Kidea) and Bernstein's Make our Garden Grow - pieces that heralded our dedication to Concordia's mission and the exciting times ahead. to project harmony in the environment through music and the arts. Concordia Artists performing on the night included Gareth McLearnon flute/director, Ahmed Dickinson guitar, William Vann organ/piano, Katy Elman percussion, Rhiannon Llewellyn soprano, Dingle Yandell bass, Laura Mitchell soprano, Nicole Crespo O'Donoghue violin, Matilda Lloyd trumpet and the Mellanie Trio. Our thrilling programme included Handel, Vivaldi, Adolphe Adam, Bach, Mozart, an International Medley and traditional carols including the Twelve Days of Christmas, with poignant readings by special guest reader, Caroline Blakiston and Concordia Ambassador Nicky Gayner. Our 2014 Christmas Concert showcased a fantastic variety of music, including pieces by Bach, Bizet, Brahms, Handel and Mancini as well as popular Christmas tunes and rousing Carols that everyone joined in with. We were also thrilled to welcome Gabrielle Speaight as our special guest reader. Gareth McLearnon, flute/director, Nicky Spence, tenor, Peter Foggitt, organ/piano, Rhiannon Llewellyn, soprano, Timothy Connor, baritone, Sam Kinrade, trumpet, Violeta Barrena, violin, Lyrit Milgram, vioin and All The Malarkey, vocal ensemble. Our 2013 Christmas Concert featured music by Purcell, Haydn, Schubert, Vaughan Williams, Mozart, Puccini and Rachmaninoff. Popular pieces included ‘Ave Maria’, ‘Lark Ascending’, ‘The Bird Catcher Aria’ and ‘Carol of the Bells’. This year we welcomed three students from St Clement Danes School, who joined Concordia Artist Ruairi Glasheen in a rendition of Little Drummer Boy. Ruairi also joined forces with Gareth McLearnon to add a new twist to the proceedings and to celebrate their Irish Heritage, performing the Belfast Hornpipe.